Until recently, Bovada Poker was the single biggest US friendly poker room – allowing players from all but a few US States from their offshore base. This room transitioned to the Ignition Casino. The software, games and promotions will all be very familiar to anyone that played on Bovada, though the color scheme and branding are different. 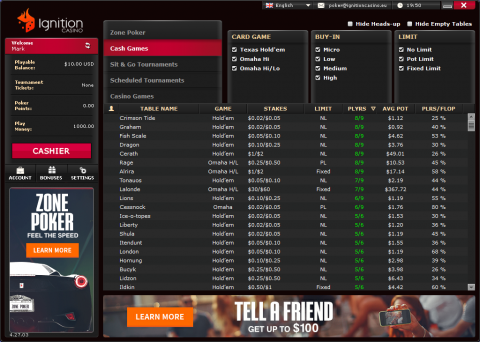 In one fell swoop, Ignition has become the single biggest US online poker site. Update: Bovada since reopened their poker room - sharing players with Ignition and the Canadian Bodog.eu. Collectively this group is known as the PaiWangLuo Poker Network (catchy, eh?!). You'll reach the same games and enjoy similar benefits from all the sites. 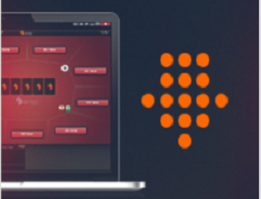 Ignition Poker maintains the ‘recreational poker model’, which means that the anonymous tables (where each player is assigned a number, rather than using a screen name) and ban on 3rd party tools which could give players an edge + restrictions on multi-tabling remain in place. This means that the games are soft (the pros with tools you find playing in 12+ games on other sites are simply not there) and the tournaments beatable. New players at Ignition Poker will start off strong with a 100% matched bonus worth up to $100 on the first deposit. This matched bonus clears as you earn points at the tables in 4 stages. The first instalment requires just 15 points to get you $5. Your target is an easy 400 points, with instalments of $20, $25 and $50 coming your way at 85, 185 and 400 points respectively. You can get another $1000 on top - though this is for their big US friendly casino. Poker points are a big part of the ongoing rewards offered by Ignition Poker. These can be swapped for poker tournament entries, up to and including entry to their weekly $100,000 guaranteed. You can buy entries to the $2.20 tournaments too (and everything in between). Promotions are going to be a huge factor in the new poker room, with Bovada offering some unique and cool ways to keep your bankroll topped up. These included qualifiers to live poker games (Vegas Vacation anyone? ), the Black Diamond Open (events) and plenty of entertaining offers tied into sports or national holidays. 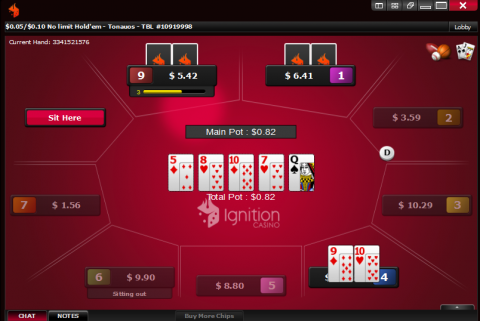 Most online poker sites these days are focused on No-Limit Holdem – with Ignition this is the dominant game too. You will find a smattering of PLO and PLO8. When you first see the games, then the lack of screen names seems a little disconcerting. Many poker players are so used to playing under a consistent name. What this does is free you from the embarrassment of making a bad play. You can leave a table, rejoin a different one and be assigned a new number… you could be literally any of the 1000’s of players online. The main effect of anonymous cash games and tournaments is that players can’t be tracked by 3rd party tracking services and tools. This gives new players a fairer playing field (since once the sharks know your playing stats those tools would tell them how to exploit them). There is a fast-fold poker variation, called Zone Poker. This puts you into pools (for different buy-ins) and randomly combines players for each new hand. You can enjoy regular cash games in 6-max or 9-max formats – though only up to 4 tables at a time. This restriction is again aimed at discouraging pro grinders by making it more difficult for them to play robotically over many games. Tournaments are also anonymous, and the schedule now boasts an impressive $2 million every week in guarantees. The biggest regular game is the $162+$9 buy-in $100k guaranteed event, which is held each Sunday. There are plenty of games with smaller to mid-range buy-ins – weekday evenings boasting a solid line-up of games. If you only have a short time to play, then check out the selection of Sit N Go tournaments. Bitcoin is no longer in the realm of the techies – its now easy to set up a wallet and move money around (and completely out of the reach of the authorities too!). Bitcoin is the main deposit method welcomed by Ignition Casino – they have a page of instructions which goes through the deposit and withdrawal process step-by-step. 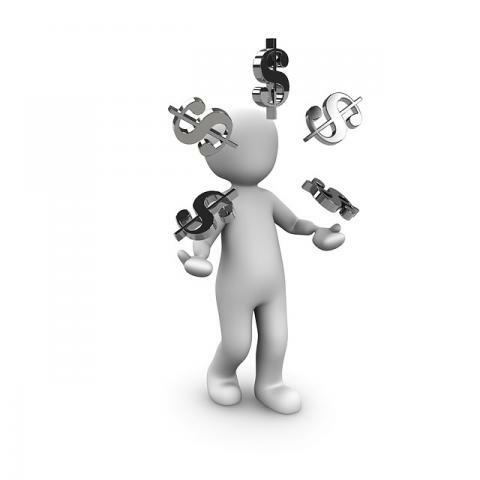 You can also make poker deposits using your credit card, with both Visa and MasterCard brands accepted. You will be making a foreign purchase, which is allowed by most cards (though some banks may restrict this as a default). Alternatives include money transfers (for example Western Union). Withdrawals from Ignition Poker are usually by check. This is free once per month, and can be sent to your door via a courier. This is an easy number one choice for US players looking for safe, diverse (in terms of games available) and profitable / soft poker games. As the single biggest pool of players of any US poker sites, the tournaments and ‘fast fold’ player pools are bigger than you’ll find anywhere else. Size also matters when it comes to promotions and special offers.